For hunters, often their most important tool is their body. Staying in shape can be half the battle between landing a big horn or going home empty handed. 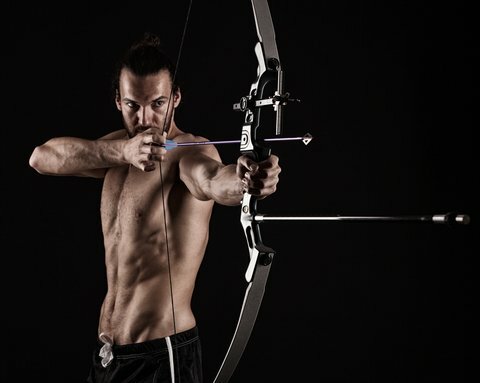 For bowhunters looking for a fun way to stay in shape and hone their hunting skills there is a new competitive sport that’s been catching on called the Train to Hunt Challenge, a biathlon of sorts of bowhunters. Similar to the winter Olympic’s biathlon where cross country skiing is combined with shooting a rifle, in the Train to Hunt Challenge bowhunters race through an obstacle course and send arrows on target in the shortest time to win a prize. The two-day event is meant to simulate the tough conditions in a real elk hunt, and it’s both mentally and physically challenging. In August, Niestrath won the second annual men’s open challenge in Denver, quickly becoming the poster child for this rapidly growing sport. Kenton Clairmont, the owner of a Crossfit gym in Spokane, came up with the idea because he said he was tired of seeing his clients stop working out after hunting season. “I figured I needed to give these guys something to train for in April, May and June and not just work out a month or two before hunting season,” Clairmont told the newspaper. Clairmont, who went into the field of personal training, found himself training many professional athletes. But there was no one out there training hunters, which he personally enjoyed. So that’s what he decided to focus on when he founded Train to Hunt in 2011. The events staged during competition are meant to mimic the challenges faced by actual hunters. In one leg, competitors have to fire at various targets in quick succession and finish a mile-long run with a 100-pound pack. This would be equivalent to rushing back to the pickup to preserve fresh elk meat. Another leg includes racing up a mountain as if trying to get in front of a migrating elk herd. If you would like to attend a state-wide qualifying event, visit TrainToHunt.com. And look for new episodes about the events on the Sportsman Channel.